Historical fiction based on a true story. Germany, after World War I. Ernst Werner Techow, son of a magistrate, a child of privilege, joins the violent right-wing response to Germany’s defeat. As a member of the para-military Free Corps and the murderous Organization C, he is recruited into a clandestine assassination network trying to bring down Germany’s fledgling Weimar democracy. These are the seeds of the Third Reich. Ernst participates in the murder of Foreign Minister Walther Rathenau, the highest-ranking Jew in the Weimar Republic. While on trial for his life, Ernst receives an unfathomable offer of forgiveness that jolts his surety in the fascist cause and sets him on a complex and harrowing journey of redemption. Throughout, he pursues his childhood sweetheart, Lisa. They are star-crossed lovers, their passion inextinguishable, buffeted by the rising storm of Nazi ascendance. Before the Court of Heaven is populated by historical figures and accurately depicts events as they unfolded in Germany and beyond. Animated as historical fiction, Before the Court of Heaven is an immunization against recurrence. 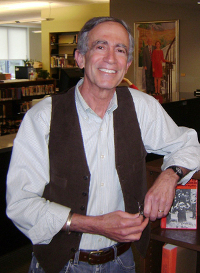 Jack Mayer is a pediatrician and a writer. He is an Instructor in Pediatrics at the University of Vermont School of Medicine and an adviser for pre-medical students at Middlebury College. Throughout his career, Dr. Mayer has written short stories, poems, and essays about his years in pediatric practice and hiking The Long Trail in Vermont. He was a participant at Middlebury College’s Bread Loaf Writers’ Conference in 2003 and 2005 for fiction, and in 2008 for poetry. LIFE IN A JAR: The Irena Sendler Project is his first book of non-fiction. He lives in Middlebury, Vermont.